It’s an exciting world we live in nowadays. With the advent of home automation it seems like we are living in the world of the future that all those books and films promised us when we were younger just without the flying cars. The fact is that there is too much to cover that can’t be included in this blog but some of the exciting things we can do right now is turn on our lights, see who’s at our front door and talk to them even if we are on holiday somewhere hot and sunny (so not the UK 😉). We can turn on the burglar alarm, send movies from our phones to the TV and (yes, we’ve finally come to it!!) control our heating and hot water all from our smart phones!! There is a plethora of choice out there which can be very confusing. In this article, we will just be focusing on 2 or 3 manufacturers. These are the ones that we , at BeeXpress, have worked with and know how to install and get working correctly. The first thing you need to know is that this can be an expensive option to control your heating but may be cheaper than rerunning your central heating pipes to zone off different areas of your home. All these options are easy to install though any initial wiring in should be done by a Qualified Heating Company (*cough* us *cough*) or an electrician (contact us if you need a good one). When we say qualified we mean that not only is the company registered with their relevant bodies (such as Gas Safe Register or NICEIC) but have also done the manufacturers training as well. BeeXpress is a Honeywell Connected Specialist and have done the Nest training as well. The Honeywell Evohome has to be the most controllable and efficient system to have. With Evohome you will need the central hub which is the Evohome base. From there you can add as much or as little to the system, as and when you want. Just want to control your bedrooms but don’t want to spend money in the bathrooms or downstairs? No problem! By adding the relevant controls to those rooms, you can now turn off the heating to those rooms from your phone. Have underfloor heating and an unvented hot water cylinder? It can regulate and turn those on and off. Its most powerful when you leave it alone. Evohome will work out how long it will take to heat each individual room so if the kitchen takes longer to heat up than the master bedroom and you want the temperature to be perfect by 6.30am just set what time you want the heating on. After a few weeks, it will have worked out that it takes 30 mins for the kitchen to heat up but the bedroom only takes 15 mins. The boiler will come on at 6am and JUST HEAT UP the kitchen for 15mins. Then at 6.15 the bedroom rad will open up and start to heat up. By 6.30 when your alarm goes off the 2 rooms are at the perfect temperature. And the guest room down the hall will be cool as the heating never came on there at all! Another benefit over other smart controls is during the day having the boiler only heat the downstairs but during the evening the boiler will only heat the bedrooms. Obviously having multiple wireless units around the house is not a cheap option although Honeywell have calculated that you can save around 40% of your annual gas bill!! 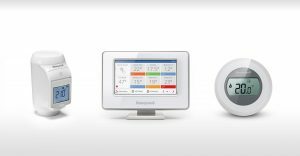 Honeywell also have a basic security that is easily added to the Evohome however it is really basic and you can get better results by adding another unit via Samsung Smart Things or IFTTT. The one you’ve most likely heard of is Nest. It’s a very smart thermostat that learns from you. When you walk past it, it will know that you’re home and keep the heating on. It will also know if someone is at home by tracking you on the connected smoke and CO alarm as well as the cameras you can set up. The smoke and CO alarm just need to be screwed into position and the indoor cameras just need to be plugged in. 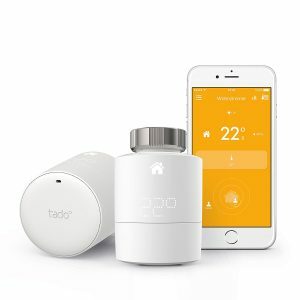 The last product we will discuss is the Tado. Honestly, we don’t really like Tado. We’ve installed a few because you buy through a monthly subscription which can be useful for customers. However, the wall unit is odd to look at with no traditional touch screen. Nevertheless, it does have Geolocation as standard which Nest and Evohome don’t have out of the box. This means that it will know when you are 5 minutes away from the house (or wherever you set the boundary) and turn the heating on. Or alternatively you can just leave the house and when you are 5 miles away Tado will turn itself off. You can also install the radiator control heads similar to the Honeywell ones to individually control each room. Of course, as we mentioned at the beginning there are tons of other thermostats out there but we at BeeXpress can only recommend what we’ve worked on before. 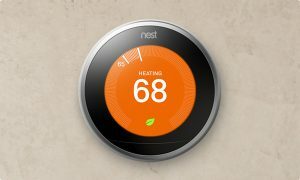 We believe that the Honeywell Evohome and Nest are the 2 best, most sophisticated products out there. If you want us to come round for a free quote or to talk further about anything please call us on 020 8970 7489.